It's been a quiet few days for Dryden in the Ithaca Journal. I hope that's because we're all enjoying the recent warmth, though we'll no doubt have a few more ups and downs before it stays warm. Most of the news over the weekend was about the state budget, which passed eleven hours late, and smells strongly of the State Senate's free-spending additions to the budget. 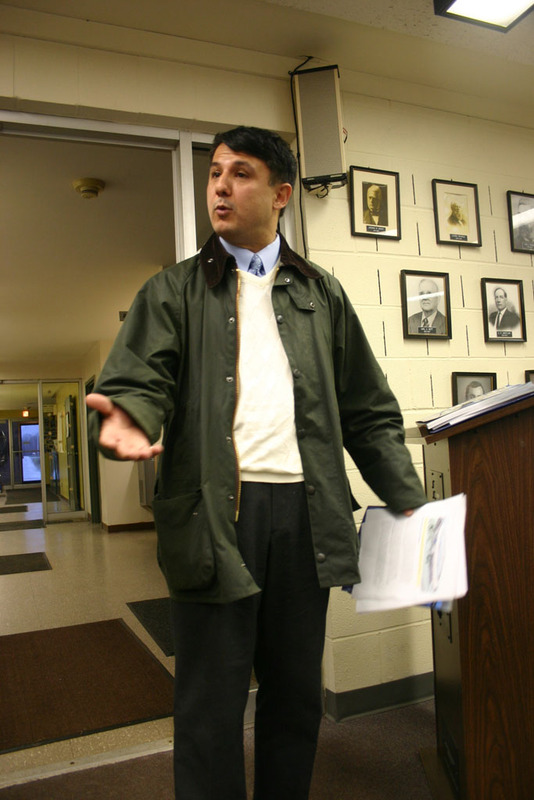 Lots of money for Long Island schools, and the return of the gimmicky property tax rebates. I have to agree with Caroline Supervisor Don Barber that these things are a really bad idea, hiding rather than reducing the real cost of government. As KAZ points out, it's painfully likely that we once again have a budget passed without much reading. And no, I don't think Governor Spitzer comes off well here. He got some of what he wanted to change, but overall our Democratic Governor played by the same three-men-in-a-room approach that's an emblem of New York's broken government. While in that room he caved in too often to a Republican Senate whose primary interest appears to be preserving its majority, whatever the long-term cost to taxpayers. Some days I'd like to see a little more "steamroller", and I certainly hope he doesn't get too comfortable in the privacy of that room. This morning's Ithaca Journal reports on today's Dryden Central School District capital spending vote, which runs from 7:00am to 9:00pm today at the Dryden Middle School/High School Auditorium. Most of the school districts that contain a piece of the Town of Dryden have some budget coverage in an overview article on school finances. On the opinion page, Tai and Justin Musson write to complain that their ballots were challenged. I've already explained that their ballots were placed on hold (but eventually counted) because they were the only ballots with errors except for one other ballot (from a Democrat) that was completely disqualified on a technicality over its postmark. It's unfortunate that the Mussons, at least one of whom apparently worked at the Board of Elections for three years, didn't read the outside of the ballot and mark it appropriately. 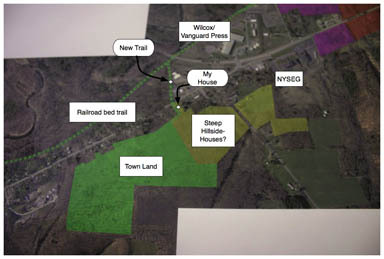 The Village of Dryden's "stance against livestock" seems to have found the support of the county legislature, which blocked an ag district designation in the Village while passing the rest. Ken Miller will still be able to harvest hay on his Spring House Road parcels, but won't have any of the protections of an ag district from neighbor complaints. The same article discusses the county's efforts to improve sustainability and get state and federal funding for a 211 community information number. Carl Haynes, President of TC3, reported on the college's growth, including new housing and new athletic center. TC3 will be starting a men's lacrosse team, and also pushing harder on diversity issues. I'm happy to report that this weblog is succeeding in many of the ways I'd hoped it would when I first started. Those successes are generally modest - people hear of things they wouldn't have heard of otherwise, and sometimes sign up - but it's good for a quiet web site. When I first started this site, most of the political conversation I heard locally was about national politics. The heavy emphasis on national politics in the media, the transient nature of a lot of residents, and the challenges of the past few years seemed to make national (and sometimes international) news a much more frequent conversational topic than anything to do with what happens around here. Like NYCO, I wanted to step out of those conversations. They often combine intense polarization with a sense that there isn't much for (most) individuals to do about them. Local issues aren't usually as polarized, and the sense of individual helplessness isn't as great a problem. The usual problems are lack of knowledge and often lack of interest. This site's made a small dent in lack of knowledge, covering maybe 3% of what's important in Dryden, and providing an index to further sources of information. Lack of interest is still a general problem, though it seems like politics is waking up here again. Unfortunately, all this work on Dryden has led me to look more closely at a subject which combines the lack of interest and lack of knowledge from local issues with the limited ability to create change from national issues. New York State government remains basically "three men in a room", with little interest in (and deep mistrust of) democracy. Practically everyone I've talked to - Republicans, Democrats, and others - agrees that state government is broken, and that a lot of the problem is in the Capitol itself. About the only people who defend the way that the state legislature works are legislators, and not all of them. Practically everyone also argues that the situation is hopeless, however - from Assemblymen cheering on the current regime to people who see reformers getting assimilated when they arrive in Albany. Then, of course, there's the problem of the word "reform", which gets used by everyone for all of their proposals whenever the word is in style. So I'm looking for advice, from a likely biased-toward-Dryden audience. Should I spend the time on state issues? (My writing at The Albany Project for instance.) Or should I write it off as genuinely hopeless, a pit that can only entrap and waste energy? All suggestions, public or private, are welcome. I'm a little surprised that the Journal doesn't mention yesterday's surprising Easter weather, except in an article from Atlanta. We went for a walk on the Jim Schug trail and found it covered in white snow, and there are still plenty of flurries today. I see that Dryden Village, which was founded on farming, hasn't stood by another farmer, Ken Miller, to get the right zoning. Shame on you Dryden and Tompkins County. We need farmers to feed us. Small farmers have nothing to do with greenhouse gases; they are talking about the factory (greed) farms that abuse the cows, give chemicals so they can give more milk. If we had more farms around, you wouldn't have the high volume of police calls in the Village of Dryden because the kids would be busy working on them. I grew up on a farm and wish I had one now. Instead we have empty stores, offer nothing, child predators that live next to the school and a high crime rate. Oh and you people that think of the smell think of when your table is empty and you have nothing to eat or your food is tainted because it came from another country. Stop and think people. Greg Potter of Freeville writes about his feeling betrayed by the Democratic leadership because of their failure to seek impeachment of the President, noting that he won't donate to Democratic candidates until this becomes a priority. Also on the opinion page, Jay Gallagher reports on strange things said in Albany. Elsewhere, Yancey Roy explores Governor Spitzer's record so far. I drive by the Cornell Vet School all the time, and many Varna residents are veterinary students. They'll be having an Open House this Saturday, April 14th, from 10:00am to 4:00pm. They're about a little ways west of the Dryden line on Route 366 at Tower Road. The latest issue of the Dryden Courier leads with the passing of the EXCEL capital project, and announces a fundraiser for the Dryden Music Boosters on April 21st from 7:00pm to 9:30pm in the Dryden Middle School/High School gym. They'll have donated desserts, door prizes, and of course, music. Beyond Measure and the middle school and high school jazz ensembles will all be performing. There are two profiles of people from Dryden. One looks at Dryden senior Wes Anderson, who is the student representative to the school board, and the other visits Stefanie Crandall, a Dryden graduate who is now teaching English in Ukraine. Matt Cooper's Inside Dryden column looks at how Good Friday isn't that celebrated in the US compared to other countries, though Dryden schools started spring break then. He also reports on Hall Pass, the Dryden teachers' band. There's a picture of Barbara Rosevear hanging Easter eggs on a tree in front of her house. Sports Around the Lake notes Dryden Baseball's loss to Lansing, and notes that the team is mostly underclassmen this year. Dryden Softball also lost, 4-3, and Dryden Lacrosse lost 17-1, but it was their first game as a varsity lacrosse team ever. In the Groton section of the paper, I was delighted to see that the Village of Groton is developing improvements for their website, including areas that collect feedback rather than just provide information. Hopefully more municipalities will follow their lead. 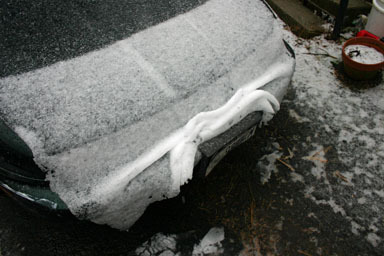 The weather outside may be frightful - snow Wednesday night? - but we've got a very small army of very small peeping chicks here reminding us that it's springtime. Angelika, Spring, and the brooder box. 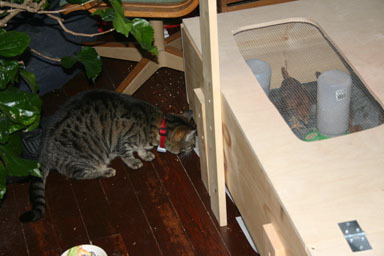 Spring seems a lot too interested in the brooder box, but hopefully she'll calm down. The cats haven't seen it yet, but the peeping seems to have their interest. The chicks themselves seem pretty content. They have food, water, and heat, which seem to be the three ingredients for happy chicks. 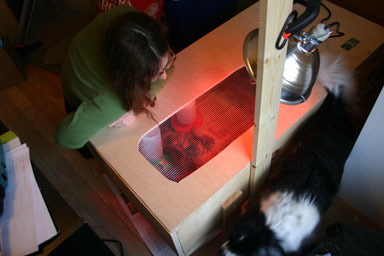 I built the brooder box, and we'll see how that works out. So far they're staying clustered by the light, but I guess that's normal for new chicks. 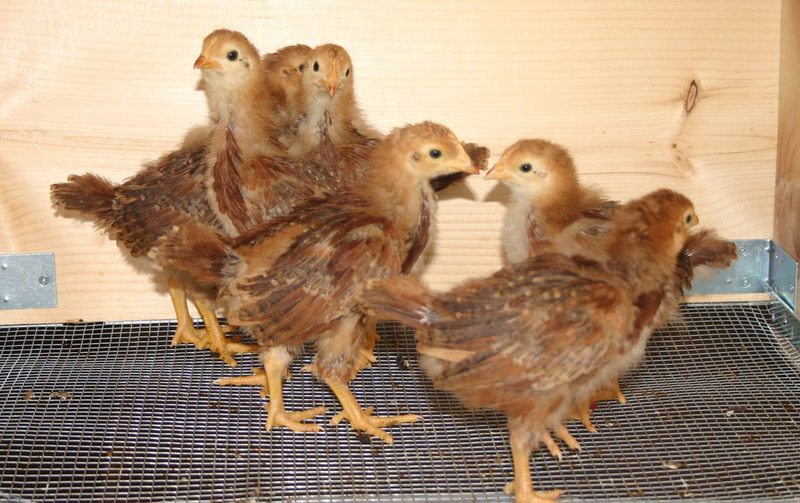 We have six Rhode Island Reds; it was supposed to be three of those and three Golden Wyandottes, but Agway was out of the others when we went to pick them up. In June I'll be building a coop in the front yard, where the cats and dogs can't bother the chickens and where the chickens can't do much damage. We're planning to integrate them with the rest of the garden over time, and we'll see how that works out. Hopefully we'll have eggs in a few months. Edwin R. Sweetland, Democratic candidate for Assembly, was born on a farm near Dryden Lake; he attended district school and Dryden High School; entered Union College where he remained one year and then transferred to Cornell University, from which institution he graduated in 1899, with the degree B.S. in Agriculture. In 1900 he began coaching football and crew at Syracuse University, from which university he received the degree Ph.M. for work in Political Economy and Sociology. He was employed as athletic director and member of the faculty at Tulane University, Colgate, Ohio State, Kentucky State, and University of West Virginia. While at Kentucky State University, he studied law and received the degree LL.B. and the following year the degree LL.M., was admitted to the Bar and taught in Kentucky State Law School for four years, and was associate professor of law, also taught in the Law School of the University of West Virginia. At Cornell, he was elected to the Honorary Society Spinx's head, being one of twenty selected because of proficiency in scholarship and student activity, a member of Phi Gamma Delta, and Acacta Fraternities, Masonic and Grange ordered and the Farm Bureau; actively interested in farm affairs. He resides on the Sweetland Homestead Farm, which has known five generations of his family. Had charge of the playground work and was superintendent of the Boys' Club at Syracuse, Scout Master of the Boy Scouts at Lexington, Ky. He was a member of the Cornell Football, Crew, and received awards in wrestling. For years he has exhibited live stock at the New York State Fair and other fairs; has been president of the Tompkins County Sheep Growers Association. His son at the age of 12 was the first New York State 4-H Club member to win First Premium at the Chicago International Live Stock Show. Mr. Sweetland has demonstrated that he understands the needs of the rural people, and, if elected, will devote time and energy to their interests. He has the education, character and ability that the situation demands. Business improvement will not come until the farmers are more prosperous. To improve conditions will be his chief concern and he will work fearlessly for economy and better Government. It's hard to imagine a political flier with that much text today, never mind a 2-inch by 10-inch space. I'm guessing Sweetland lost this race, given the Republican nature of this area at the time, but the comparison between the space he gives his credentials and the space he gives his platform is pretty amazing. I did find an obituary for Sweetland, which focuses on his coaching with a bit about his politics. 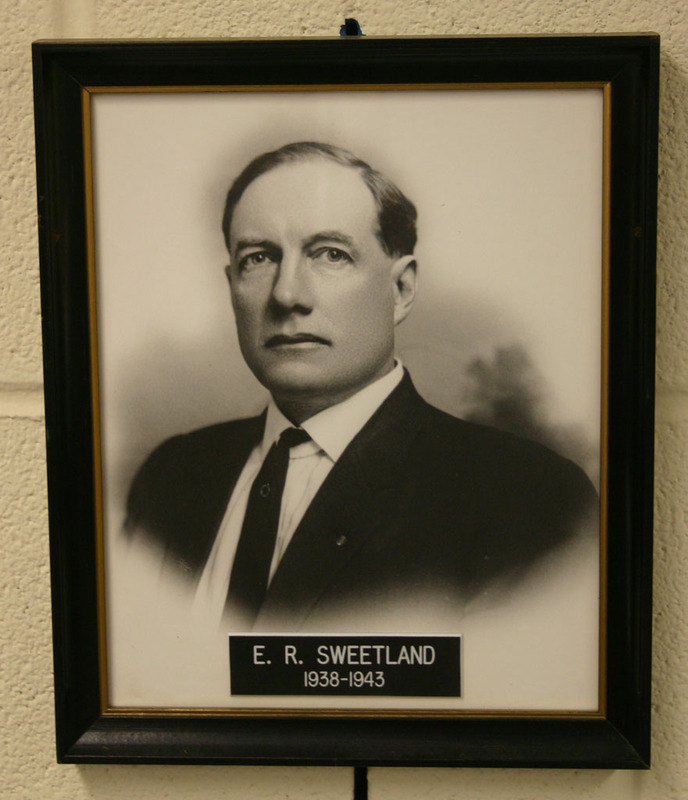 Update: I took a picture of Sweetland's photo at the Town Hall. E. R. Sweetland's photo, Dryden Town Hall. There should probably be a contest to describe the shape of the New York State Senate district that includes Dryden, presently represented by State Senator Jim Seward. Right now, my vote goes to "Abraham Lincoln riding on a vacuum cleaner", from Russ Haven of NYPIRG. It's not quite the "T-bone steak" I've called it before. What would the prize be for naming it? Maybe a member item for your favorite organization? Somehow, though, the Senate usually prefers to pretend these questions don't exist, so don't mention those organizations. They might just not get the prize. Update: The description was intriguing enough that the New York Times blog picked it up and even has a map. And now someone dressed the part! Winter really doesn't want to end. About 100 gallons of No. 2 fuel oil spilled from an oil tank in the basement of a house on the property, which is located at 405 Snyder Hill Road, according to the NYSDEC spills database. The 10 inches recorded by the Northeast Regional Climate Center at Cornell University from 8 a.m. Monday and 8 this morning set a new record for the greatest one-day April snowfall. The two-day total from 8 a.m. Sunday came to 16 inches, the most for any two days in April. The 16.3 inches of snow recorded so far in the month left Ithaca 13.9 inches ahead of normal for this far into April. So far, it’s the third-snowiest April and within striking distance of the second-snowiest, 17 inches in 1918, but well behind the all-time snowiest April the 22.3 inches of 1894. The most recent April with more than a foot of snow was 1983. On the season, Ithaca has recorded 70.3 inches of snow, 3.6 inches ahead of normal. The month’s total is more than that in March, 14.2 inches, and even more than in November, December and January combined, noted regional climatologist Keith Eggleston. The early winter was unusually warm, something attributed to a weak El Nino and a weather pattern that kept cold Arctic air out of the Northeast until mid-winter. The woman also said Cannady was armed with a handgun. Deputies located Cannady driving the vehicle in Dryden. Deputies found a Smith & Wesson revolver with a defaced serial number and 53 rounds of .38 caliber ammunition in the vehicle. Cannady resisted arrest, the Tompkins County Sheriff's Office said. On the opinion page, Assemblywoman Barbara Lifton explains how it's possible to get more school money for your district if you've been sufficiently respectful of the leadership and ask for their help. Okay, it's money you need to work for, not just crates of gold sitting quietly and waiting for someone to discover them. The Life section of today's Journal reports on the How, When, and Why of Forest Farming resource center, produced by Cornell Cooperative Extension. Much of Dryden's current forest used to be farmland - and it can be again, while still keep the forest cover. Otherwise, local news is pretty quiet - I'm guessing Dryden residents are enjoying the weather. I may be the only person (apart from State Senator Thomas Libous) who's still interested in this, but the State Senate seems ready to hold confirmation hearings for Angela Sparks-Beddoe, Governor Spitzer's choice to lead the Public Service Commission. If it wasn't for her longtime work for NYSEG/Energy East, as a lobbyist for a company that has, to put it mildly, pushed the boundaries with the PSC, I'd probably be a supporter. Unfortunately, I'd like to hear a lot more about how she plans to put that past behind her. Her nomination is slated to be considered Tuesday by the Senate Energy Committee. Although the panel or the Senate Finance Committee, which also must act on nominations, technically could reject Sparks-Beddoe, putting her nomination on the agenda is practically tantamount to approval. Update: Maybe that approval isn't so guaranteed, though the dispute is over a Spitzer aide's interactions with the PSC. A Dryden man is in critical condition after a motorcycle accident, and there's a further report on an Etna mobile home fire apparently caused by a coffee maker. Need health insurance? Know someone who does? There's a guest column about an enrollment drive for programs that can help. At the state level, a proposed campaign finance reform failed on Reform Day in the face of opposition from Senate Majority Leader Joseph Bruno. I see from the Albany Times-Union that something potentially helpful did happen on Reform Day: the Assembly did pass some rules changes that inch them closer to being a public deliberative body with functional committees, plus ethics training. Last November, the Route 13 & 366 Corridor Managment Study held an information meeting. Tomorrow night they're following that up with a workshop at the Dryden Village Hall, 16 South Street, Dryden (map). The meeting will run from 6:00pm to 7:30pm, and will include updates and a chance to provide input, as well as "graphics of the preferred development option", which leaves me wondering how much there is left for input. We'll see! Ithaca Journal columnist Cathy Wakeman celebrates 100 Dryden Town Talk articles with a look forward at some coming events. There will be a student recital tonight at the Dryden Middle School/High School auditorium at 7:00pm, and a Guest Artist workshop/performance with Los Bandidos on June 6. Mary Pancoe, the Dryden Senior Citizens' "Sunshine Lady", will be honored with Dryden Sertoma's "Service to Mankind Award" on Saturday at 1:00pm; reservations are preferred. Finally, on May 5th, the Christopher W. Ackley Memorial Skateboard Park will be dedicated, with regular opening getting started on May 7th. Sunday's motorcycle accident has unfortunately proved fatal for the driver, Dryden resident James Richards, the director of Cornell Vet School's Feline Health Center. Richards was trying to avoid hitting a cat crossing the road. TC3 used their new baseball field on a cold and windy day. It's the right thing to do so we can fully implement the county-wide system. The How They Voted list for the county legislature is all unanimous votes this time. Dairy Day is celebrated annually in Dryden to show community support for farmers and agriculture. Sadly, the votes of our county legislators show shallow understanding of the importance of agriculture here and give farming an undeserved black eye. They should reverse themselves. I wrote earlier about how the shape of the 51st State Senate District, which includes Dryden, looks like "Abraham Lincoln riding on a vacuum cleaner." Someone took that quote and ran with it all the way to Albany, showing up as Abe Lincoln with a vacuum cleaner. He's not quite the shape of the district, but it's still funny. People in Dryden frequently complain when you threaten to put a trail across their property. 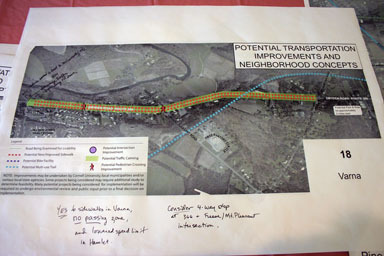 I was happy tonight to see that the Route 13/366 Corridor Study plan shows a new trail going across my lot, something I'd never have thought would happen. There's even a nice connecting trail (a boardwalk?) through the Cornell Plantations swamp across the road to reach the railroad bed that should someday be a trail. People in Dryden also tend to complain when they see a map that suggests a road going through their house. 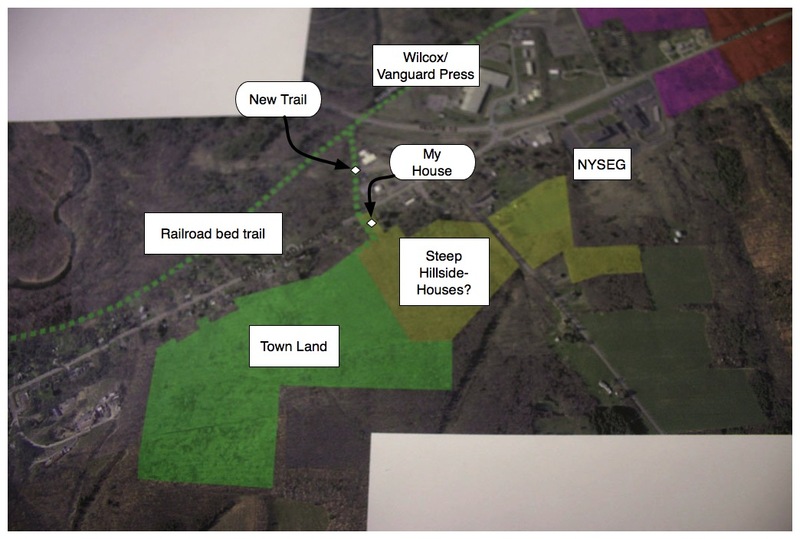 I'm not thrilled about that, but I'm deeply confused when my property is highlighted as a connection between residential housing on the steep slope behind my house and Route 366. They didn't notice, say, on the Town of Dryden Comprehensive Plan's map called "Natural Constraints to Development", that it's really steep back there? Slopes of greater than 15%? And for a long distance? This seems really unlikely to happen. 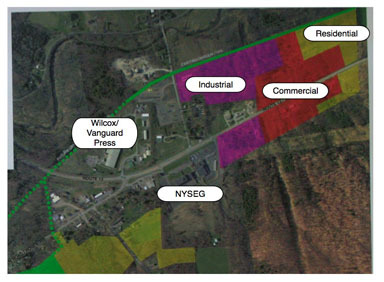 I don't know enough about the Village of Dryden to comment on their markups for that, though I know that the Village was at one point planning major expansion in its northeast corner and abandoned it largely because of wetlands issues. Maybe those issues have faded enough to put a connector road through from Lee Road to 392, but it still seems like a stretch to me. There may well be more room in the southwest for housing. 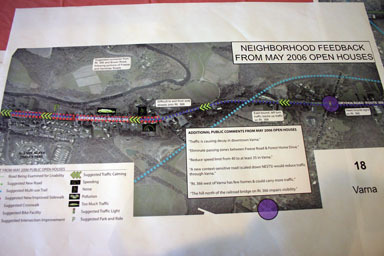 There may be discussion in the actual written plan - which wasn't distributed at the meeting - discussing ways to expand existing nodes in 'downtown' Varna and at the corner of Routes 13 and 366, but what the maps seem to show is the creation of a new industrial / commercial / residential zone along the Route 13/366 overlap. I'm not entirely sure what they think is the allure of that spot - while the existing node is largely in the new Empire Zone, the area to the east is pretty empty, with some roadside development, but the Comprehensive Plan pretty deliberately left a corridor of open space in there as a break along Route 13. 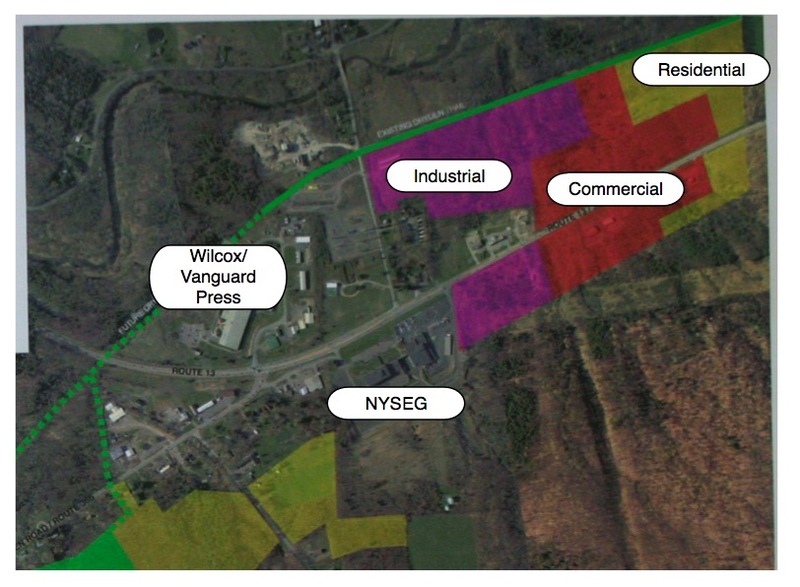 I have a hard time imagining who will want to be the pioneer businesses and home builders in that area. Yes, it's near a water district - Vanguard Press (formerly Wilcox Press) has water, but the Pinckney Road water and sewer district still hasn't taken off, and making this expanded node work will mean creating a large new area in a place that isn't yet served by water. Even if the Pinckney Road districts come to pass, the commercial development will likely stay further west, as that area isn't completely filled in. 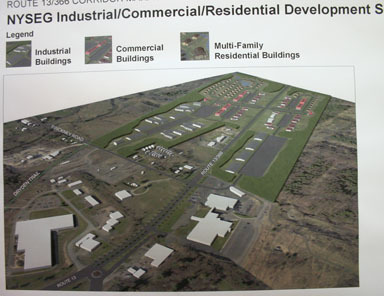 Then there's the looming question of the looming NYSEG building, a fortress built with its own cafeteria, water, and sewer systems, surrounded by a moat of parking lots and fences. All I heard was hope that it would somehow revive - after all, NYSEG's looking for tenants - and provide extra energy for this new eventual node. I wasn't entirely enthusiastic after the initial public meeting, but it's especially strange to see how little connection I saw between that meeting's conversation and the resulting plan. I'm sure it all fit in somehow - or did it? The Town of Dryden Comprehensive Plan was a huge pain to create, but it was very clear that the people creating it understood the terrain, the history, and the people affected by their plan. 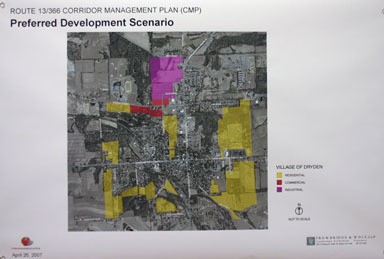 This Corridor Plan demonstrates no such understanding. While its drive for more housing is admirable, its path to get there is broken, broken enough that I have to question the competence of the creators of this plan. They apparently didn't see steep slopes or find out why certain places haven't been developed. They seem to think that zoning in a new node will create it, despite mixed results for development near that area. I hate to say this, but I strongly recommend that the county and the planners scrap this plan. They can try again if they want (and I'd like them to), but this plan is broken, too broken to provide useful guidance for future development along the oldest corridor in Dryden. Building a better plan requires examining how new development meshes with old development, not just looking for places to drop more buildings. If you'd prefer to make up your own mind, I've posted a gallery of the maps and some other photos. I've made the full-size images larger than usual so there's a better chance of capturing detail. And definitely, please comment. This morning's Ithaca Journal includes a brief on Dryden Rotary's chicken barbecue in the Clark's parking lot on North Main Street. They plan to have chicken available around 11am. The Monitor also lists an underage Dryden resident's DWI arrest near the end of a listing of DWI arrests. It seems that the stories I post which include farm animals on my property are the ones I hear the most about, whether it's last summer's plowing of the back yard or my more recent piece on six chicks coming home, hopefully to provide us with lots of eggs in the future. They're no longer the fuzzy little yellow critters they were before. Chicks growing up, gaining feathers. They've been growing feathers since about two days after we got them, and they've become much larger. They seem pretty happy in their box, running around a lot of the time, sleeping other times. They're definitely eating and drinking more than they were. 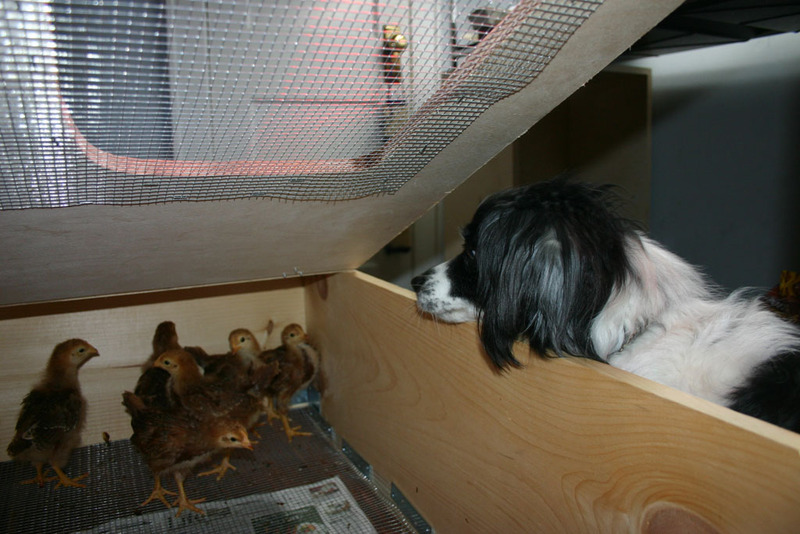 Spring is definitely interested in the chicks, and sometimes whines because she can't get at them through the box. Spring checks out the chicks. Rowena was also very interested in the chicks. Rowena looks for a way to visit.. I think our pets may have different hopes for these chicks than we do. Hopefully they can co-exist, but just in case (and for other convenience anyway), the chicken coop will be out of the range of the cats and dog. 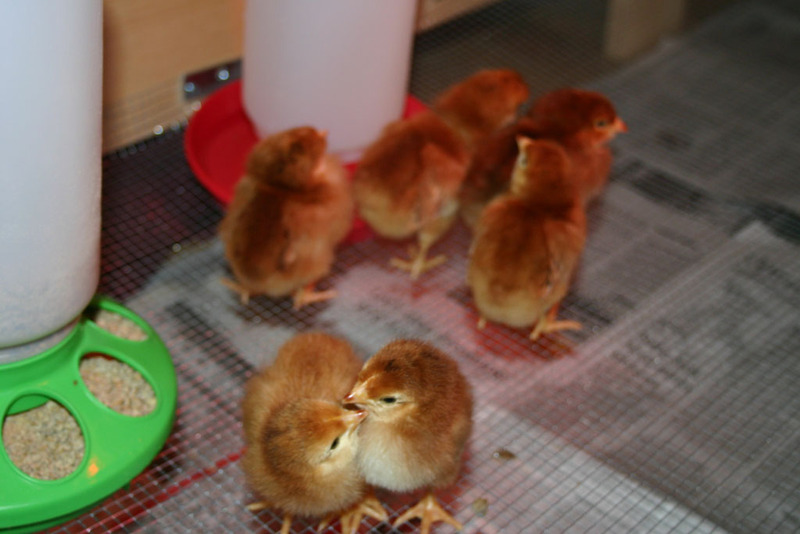 Update: For more chicks and chickens, see Dryden Daily KAZ, and Five Wells often has chickens as well. Managing Editor (and Dryden resident) Bruce Estes asks readers for feedback on their coverage of the Jacob Carter case, which recently concluded. There's also a link from that article to the original felony complaints about Carter, which are graphic. There's also a TC3 Honor Society induction list, and How They Voted in Albany. I say we here in upstate New York put out a call for people who don’t need to be constantly entertained, and who are skeptical about the 21st-century American dream and can imagine a better one; who recognize that upstate New York never was, is not, and will not be just like the rest of the country; that it is situated in a historical time zone that — in both good times and bad — is a few decades in the future from the rest of America. Most of upstate - with a significant exception in Tompkins County - has stable but aging populations, or declining populations. We've seen jobs move from upstate to the Sun Belt to Mexico to China. Manufacturing jobs in particular have left, even in Tompkins County, as employers demonstrate more loyalty to the bottom line than to places or employees. If this is the future for America in twenty years - and it's pretty easy to see how it might well be - then America has some hard thinking to do about how it wants to deal with those prospects. It was in this kind of mood that I stumbled across Bill McKibben's hard question: How Would You Know if The Economy Was Working?. There's a lot there to think about, much of it questioning the value of our current system, and reminding us of forms of 'capital' - community and ecological - that we seem to burn through quickly on our way to accumulate cold hard cash and the many things it buys. All of these plans may, or may not, sacrifice some measure of growth for other goals: durability, satisfaction, and so on. They obviously imply big change. I have no utopian endpoint (utopians are those who think the whole world will converge on the American middle class), only the desire for a new trajectory, one which places more emphasis on belonging and less on belongings. Given that we're not going to stop global warming entirely, and indeed may be facing a significantly less benign world in the future, this strikes me mostly to the good. I know we in Tompkins County enjoy thinking of ourselves as an oasis of growth, but it's worth pausing to think about how we'll deal with each other and our place if perpetual growth turns out not to be perpetual. Dryden's Second Hundred Years - A Central New York Village in the Twentieth Century: Part I (1897-1942) came out in January, filling a historical gap created by all the time that's passed since George Goodrich's A Centennial History of Dryden . Unlike George Goodrich, whose book covered the entire town (with an unfortunate gap in Bethel Grove), Elizabeth Denver Gutchess focuses squarely on the Village of Dryden, though she covers the interactions between the Village and its surrounding farms as well. Gutchess combines stories from the broader sweep of American history with details from the Dryden newspapers, memoirs (notably A. K. Fletcher's Like Hell It's Fiction ), and some pieces from the Dryden Historical Society's archives. The result is a great telling of Dryden history - and a great telling of American history told through the experience of a small town. Gutchess explores the changes that hit Dryden in this period, from the advent of the automobile to the shift from horses to tractors to the coming of the telephone, as well as the periods everyone learns about in school: World War I, the Great Depression, and World War II. The stories retain their local flavor, and you can find things like the origins of local businesses - George Bailey starting his insurance company in his home in 1936 - the first Old Home Day, in 1928, and stories of the Dryden Fair, the Dairymen's League, men and women dying in the 1918 Flu Epidemic, and the Dryden men who went off to war, not always returning. If you have any interest at all in how Dryden came to be, this is an excellent place to find out more. It starts in a world that sounds familiar, but isn't really, and tells the stories of the major steps that world took toward becoming this world. I'd love to see a continuing volume taking this to the present, or at least 1997. My main complaint about the book is its lack of an index, but as it's self-published, that's hardly surprising. 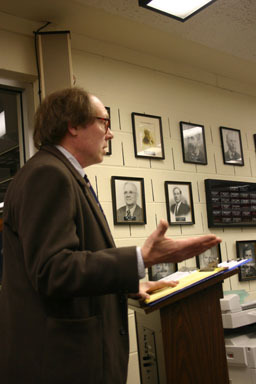 The Goodrich history also lacked an index when it was first published. One last thing may be important to note for some readers: this is not the second volume of the Town Centennial History that was planned back in the 1990s. This appears to use only readily available documentary sources, not the material collected for that book. I'd still love to see that appear as well, and I don't think the two histories would be in that direct a competition. Back on the 18th of April, the Cornell Transportation-General Environmental Impact Study (t-GEIS) held an open house event much like the one they held in May. While the one in May started with a clean slate of maps, this one presented a lot more information about directions it looked like they might be going, with details provided for various neighborhood's affected by Cornell's tremendous transportation impact. Varna feedback from May meeting. The Cornell t-GEIS approach was a lot more like what I'd expected from the Route 13/366 Transportation Corridor Study than what I got. They collected specific feedback from residents, examined it, and then developed a plan combining that feedback and their expectations for what might happen. They focused on transportation, and addressed current problems in today's nodes. So far, I have to say that this is a planning process I'm really enjoying watching. Dryden news is quiet for the weekend, but there's an update on New York energy issues, including tangled questions about the nomination of Angela Sparks-Beddoe to lead the Public Service Commission. And while none of these hospitals are in Dryden, I'm sure we'll be happy to know that a statewide report shows local hospitals doing pretty well.